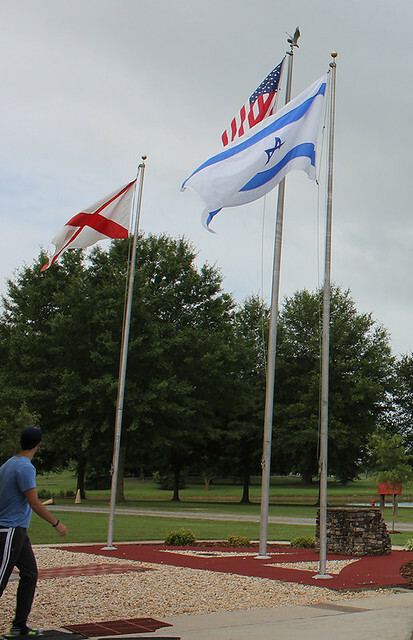 Three flags: Camp Darom, the Orthodox camp coordinated by Baron Hirsch in Memphis, settles in at its new home near Blountsville, Ala. Rabbi Jonathan Miller of Birmingham’s Temple Emanu-El wrote this piece for al.com on why the Iran deal is bad for the U.S., Israel and the Middle East. Marking the release of “Go Set A Watchman” this week, Springhill Avenue Temple in Mobile is hosting Pastor Milton Saffold at the 6 p.m. Shabbat service on July 17, to speak on racial reconciliation. He is minister of Stone Street Baptist Church. The congregation was established in 1806. The church itself was established in 1843. The African American church was established from the Saint Anthony Baptist Church when white representatives of the church purchased a piece of land for a separate African American church. That daughter, Meredith Hoffman, has a piece at Vice this month on the abuse of transgender immigrants in U.S. detention centers. Birmingham native Dale Russakoff has a piece in the New Yorker about “The Atticus Finch We Always Knew,” saying the “two Atticuses” could coexist, and did so in Birmingham. Mohammad Abdulazeez, who killed four Marines in Chattanooga, spent seven months in Jordan last year. His father, who was on a watch list, is Palestinian, from Nablus. As a teen, Chattanooga Mayor Andy Berke was a regional board member in Cotton States AZA of the B’nai B’rith Youth Organization. Meet Gal Gadot, the new “Wonder Woman” who was born in Rosh Ha’Ayin and says serving in the IDF helped prepare her for Hollywood. The Legal Aid Society of Middle Tennessee received a $13,000 grant from MAZON: A Jewish Response to Hunger. An article pointing out how Reform Jews can die for Israel but not be buried as Jews centers on Seth, who was raised in Charleston, S.C. The Anti-Defamation League office in Atlanta sent a letter to Alabama Governor Robert Bentley, urging the removal of the Confederate battle flag from the Alabama Law Enforcement Agency emblem. The Southwest District of Women of Reform Judaism will have an Area Day for Sisterhoods in New Orleans, Baton Rouge and Jackson. A wine tasting and light lunch will be held at Bin 428 in New Orleans on July 26 from noon to 2 p.m.
Democratic Presidential Candidate Bernie Sanders will be in New Orleans on July 25 for the Jefferson-Jackson Dinner. A Jewish community Day of Service will commemorate the 10th anniversary of Katrina, with volunteers working with the St. Bernard Project to rebuild homes on Aug. 9 in New Orleans. Two regional Jewish singles weekends are upcoming — in Austin this weekend and Memphis in August. Touro Synagogue in New Orleans is livestreaming its services, and is hosting the community's July joint Reform services. The full service will be available for a week and the sermons will be available beyond that. Livestreams from the Forgotson Chapel are here and from the Main Sanctuary here. Fundraising continues for Houston's Jewish community in the aftermath of flooding. In New Orleans, the Force family did a $2,000 gift in honor of Morton Katz's presidency of the Jewish Federation of Greater New Orleans. Another match of up to $25,000 by the Goldring family and Woldenberg Foundation was announced. The Federation and Jewish Endowment Foundation of Louisiana also sent $5,000. NECHAMA and All Hands are looking for volunteers to assist with cleaning, packing and addressing needs of those affected by the flooding. To volunteer, contact Michael Kahlenberg at (281) 630-4926. To contribute, click here. The Hillel at Mississippi State is running a GoFundMe campaign to increase programming and Jewish enrollment. Birmingham’s Knesseth Israel will have “Tisha B'Av: Fast for Feast” on July 26 at the Friedman Center. The money one would spend for food on the fast day is recommended as a donation toward feeding hungry children in Alabama. At 6:15 p.m., KI will screen “A Place at the Table,” then hold a 7:45 p.m. class on hunger in Judaism. After evening services at 8:15, there will be a break-the-fast at 8:33 p.m. The W.C. Handy Festival runs from July 17 to 26 in Florence, and once again Temple B’nai Israel will be a venue. On July 25 at 2 p.m., “Pickup Shticks” will feature Rabbi Nancy Tunick, and Scott Whitehead and family. Chabad of Mobile will hold a Jewish Learning Institute course, “Justice and the War on Terror,” July 22 and 29 at 7:30 p.m. at the Hampton Inn on Providence Park Drive. The two sessions, “Negotiating With Terror” and “Torturing to Save Lives” are CLE accredited. Hadassah of Baton Rouge and The Red Shoes Center for Personal and Spiritual Growth are partnering for an inspirational retreat featuring Rabbi Yael Levy. “Sabbath of Psalms: A Deep Yearning” will be held July 17 and 18. It will be an interfaith exploration of the Psalms under the structure of Shabbat. The weekend begins at 6 p.m. on July 17 with Shabbat dinner, followed by teachings, reflection, meditation and song. The sessions on July 18 will be from 10 a.m. to 4 p.m., with prayer, guided meditation, Torah and Psalm study. Registration is $50, including dinner and lunch. Levy is director of “A Way In: Jewish Mindfulness Center” and author of books on the Omer and Chanukah. The rabbi at Congregation Mishkan Shalom in Philadelphia, she was also named by the Forward as one of America’s most inspiring rabbis. The Chabad Jewish Center in Metairie will screen a new documentary, “With My Whole Broken Heart,” at the start of Tisha B’Av. The film will be at 9:30 p.m. on July 25. The film details valiant parents who lost children to terrorism, and also follows the lives of two of the youngest survivors of Auschwitz and Buchenwald, who changed the Jewish landscape. The film is framed around the Lubavitcher Rebbe's response to the 1956 terror attack in Kfar Chabad that claimed lives of 5 students, and features interviews with Daniel Pearl's parents, Ruth and Judea Pearl; Sherri Mandel, mother of Kobi Mandell; former Israeli chief rabbi Yisrael Meir Lau; and Rabbi Nissan Mangel. Beth Israel and Anshe Sfard will team up for joint services on Tisha B’Av. On July 25, there will be a 9:15 p.m. service and reading of the Book of Lamentations at Beth Israel in Metairie. The July 26 service will be at Anshe Sfard at 9 a.m., followed by Rabbi Gabe Greenberg of Beth Israel and Rabbi David Polsky leading and explaining selected kinnot, the special dirges recited on Tisha B’Av. B’nai Zion in Shreveport is holding a summer film series following the 6 p.m. Shabbat services. Pizza, popcorn and drinks will be served, and each film has a Judaic tie. Admission is free, but donations are appreciated before or after Shabbat. The July 17 film will be “The Jewish Cardinal,” followed by the 2006 film “O Jerusalem” on July 24 and the 1977 classic “Oh, God!” on July 31. On July 18, the Shabbat speakers series at Anshe Sfard in New Orleans will feature Allison Padilla-Goodman, the South-Central Regional Director for the Anti Defamation League. She will speak at the conclusion of the 9:15 a.m. service, around 11:30 a.m. A buffet lunch will follow. Anshe Sfard will celebrate the ancient holiday of Tu B’Av on July 30 with a white linen party at Richard Fiske’s Martini Bar. Rabbi David Polsky said Tu B’Av was seen as one of the happiest days of the Jewish year, as single women would borrow white dresses and dance in the fields. Moishe House New Orleans is co-sponsoring the event, which will start at 7:30 p.m. The New Orleans Synagogue Softball League’s playoffs have been pushed back to August 2 as the season was extended due to rainouts. B’nai Israel in Baton Rouge will have its Trash and Treasure Sale from July 31 to August 14. Anshe Sfard and AVODAH will have a joint Shabbat event on July 24, starting with a Carlebach-style service at 7 p.m., led by AVODAH member Aaron Leven. A dinner for young Jieux-ish professionals will follow at 8, with a discussion on "Isaiah's Vision and Ours: Envisioning Social Justice Today." Discussion leaders will be AVODAH corps member Rob Greenberg and AVODAH New Orleans Program and Development Associate Alana Himber. The Chabad Center in Metairie will have a Hebrew reading crash course for beginners, starting Aug. 2 and running for six Sunday mornings. Chabad in Metairie is having a community Shabbat dinner on July 17. Services are 7:15 p.m, followed by dinner at 8 p.m. Reservations are $18 for adults, $10 for ages 3 to 12, $50 for families. Reservations are due by July 14. Shir Chadash's annual Nearly New Sale wraps up with a half-price sale on July 19 from 10 a.m. to 2 p.m., and July 20 with a Sunset Savings Clearance Bag Sale from 6 to 9 p.m. The Jewish Federation of Greater New Orleans announced the launch of its new Strategic Impact Fund. All Jewish organizations, including synagogues, in the Greater New Orleans area are welcome and encouraged to apply for grants up to $5,000 out of a pool of $25,000 for programming that addresses one or more of eight community priorities that are listed on the application. Applications and supporting materials are due by August 12. Contact Allison Kushner with any questions. Rabbi Debra Kassoff will lead a “how to” class for Beth Israel in Jackson on doing a Havdalah service, at the home of Amy and Arty Finkelberg. Dessert will be provided for the event, which is July 18 at 7 p.m.
Chabad of Mississippi will have a program on the History and Mystery of the Holy Land, July 22 at 7 p.m.